Terry says that Butch had a home before he came to live with us. 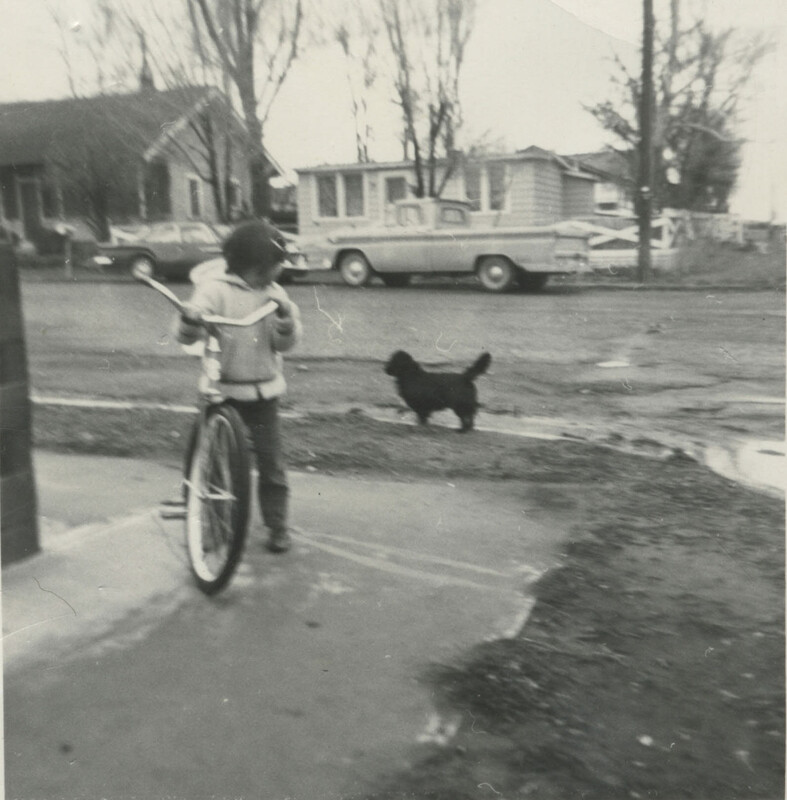 I was much to young to remember – we still had Mom’s ankle-biter, Squeaky. Butch was all black except for a white streak on his breast. He was some sort of accident between a big dog and a little dog – part Lab, part Cocker Spaniel, part Gordon Setter, part — well, we never knew. He was just an odd-looking dog close up. He moved in with us when we still lived in Elko and his owners soon ceded him over to us, as he obviously preferred the company of three rowdy children to whatever their household offered. He had a number of bad habits and I sincerely doubt he was neutered – people didn’t go around neutering their pets in those days. Dogs and cats were lucky to get rabies vaccines, let alone distemper. There were no laws requiring licensing of pets until later, and no dog leash laws until Butch was already an established roamer. No one worried that he’d wander off. He was devoted to us kids. Where we went, he went. If the Coffey’s brought their loose dog along, Sox, we’d have to keep them from fighting (Sox had it in for Butch), but that was the biggest worry we had about Butch. That, and the fact that he chased cars. He hated cars. He devoted his life to catching a car. We moved from Elko to Paradise Valley to Lay Street in Winnemucca, and finally, to Minor Street. Butch made every move with us. He tolerated the invasion of Jacob, the cat. He permitted us to dress up the stray red tabby that would come visit. Cats weren’t Butch’s thing. He killed snakes. Bull snakes, rubber boas, rattlesnakes, garter snakes. If it was a snake and Butch got wind of it, it was as good as dead. If he ever got bit, we never knew. Terry theorizes that the long hair protected Butch from the fangs of many a rattlesnake, and he might be right. Whatever the case, snakes were always on the losing end with him. Rocks. Never was a dog so enthralled with playing “fetch”. but “fetch” had to be done with the rock of his choosing. he wasn’t interested in balls or sticks. He always came back with the same rock you threw, even if you threw it into the Humboldt River. Sometimes, he’d be under water for so long, you’d think he had drowned – but then he’d pop back up to the surface, rock in his jaws, and swim back to shore. We tested him on it. We memorized the rock we’d throw: how many jagged edges, the color, the size, the texture. He always returned with the same rock. The move to the house on Minor Street happened at about the same time that the city council decided that dogs needed to be licensed and restrained. A new leash law went into effect. We could collar Butch and license him, but he quickly scaled the 8′ high chain-link fence and trotted off on his daily errands. There were a few dogs that were “grandfathered in” on the new leash law – dogs known to be reliable, friendly, and unrestrainable. Bidart’s collie. Thompson’s Norwegian Elkhound (Nipper, who was an old friend of mine). Lawrence’s Gordon Setter. The extremely dumb black lab, Kelly, who loved to run out and bark at kids, but if you bent over as if to pick up a rock, retreated quickly, tail between his legs. Butchy. I used to know all of their names, but can only recall a few of them now. Once upon a time, there was a Hoover Vacuum Salesman who cornered my mom. He came by once and she entertained him, but she didn’t want to buy a Hoover from him. He kept coming back. She kept hiding from him. At one point, I recall him walking up to the house and mom ducked behind the picture window. “I’m not here!” she hissed to us kids. We didn’t have to get rid of him. He walked back into the driveway in time for Butchy to see him. Butch must have known how Mom felt about him, because Butch laid his chops into the salesman’s ankles. The salesman roared that he’d sue, but us kids were laughing so hard (and Mom was rolling on the floor). Butchy chased that salesman out of the driveway and out of our lives forever. 1965, February. I was 9 years old and in the 4th Grade. Sunday. We went to church – all of us except Dad, who never went. Home again, and a usual Sunday day – except that Butch didn’t come around. By Monday, we kids were beginning to get worried. Butch roamed, but he never spent days or even a night away from home. How many days did we wait before we began to ask the questions? How Mom took each one of us into her bedroom, separately, to tell us the tale. How many tears? Dad heard the yelp, heard the brakes. He got up, looked out, and there was Butch – killed by his favorite hobby: car chasing. We were at church, Dad had time. He loaded him up, drove him into the desert, and buried him – tears streaming, a show of emotion Dad would never acknowledge in front of us kids. We all cried, but I cried so hard that I got the worst case of tonsilitis I had ever had. It was time, Doc Hartoch said, for me to have my tonsils out. So I was off to the hospital where I breathed in that awful elixir of ether (“10-9-8-” out) and my tonsils were removed. I puked blood upon my recovery. I was sent home with a prescription for an ice cream diet (lime sorbet, as I recall). I think it hurt Terry more as he was older and remembered more, but that didn’t diminsh my pain. Dad never spoke of it. It was an awful month.